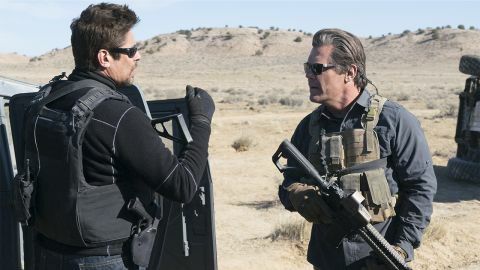 Sicario 2: Soldado review: "Throbs with energy and tension"
A robust follow-up, which carries the same brooding atmosphere and tension of the original. The young cast additions are also excellent. A sequel without the original’s visionary director or leading lady might spell trouble, but Sicario 2: Soldado is surprisingly rigorous. It starts all over the map, quite literally, as narrative strands jump between Texas, Kansas, Djibouti, and Bogotá. A man blows himself up at the US-Mexico border, while suicide bombers attack a supermarket. Josh Brolin’s CIA suit Matt Graver questions a Somali criminal, drone-striking his home when he refuses to talk. It becomes clear that cartels that made money in narcotics are turning to people-trafficking – whether it’s terrorists or everyday citizens needing illegal passage into America. Drafted in to disrupt this, Graver is given free rein to fight “dirty” and heads to Colombia to recruit Benicio Del Toro’s Alejandro Gillick, the lawyer-turned-assassin (or ‘sicario’, if you prefer) who was teamed up with Emily Blunt’s FBI rookie in the first Sicario movie. While Blunt’s Kate Macer is surplus to requirements for the story, returning screenwriter Taylor Sheridan ensures the theme of innocence corrupted remains. Here, Isabel – a precocious 12-year-old who we first see fighting in the playground – gets to understand the nature of her father’s nefarious work after she is kidnapped, flown to Texas and then used as bait in a complex CIA operation. Another adolescent in for a rude awakening is Miguel (Elijah Rodriguez), a Mexican-American from McAllen, Texas, whose path will cross with Isabel and co after he’s lured into the business of people-smuggling. Critics will argue his narrative is a set-up for further sequels, but really incoming director Stefano Sollima crafts Sicario 2: Soldado (the subtitle means ‘soldier’) as a self-contained ‘episode’. Sollima (TV series Gomorrah) and Dariusz Wolski, Ridley Scott’s recent cinematographer of choice, do a fine job of emulating the brooding atmosphere conjured by Denis Villeneuve and Roger Deakins, the first film’s director-DoP dream team. Likewise, Iceland’s Hildur Guðnadóttir – formerly a collaborator with Sicario’s composer, the late Jóhann Jóhannsson – provides the same kind of bone-shaking rumble for the soundscape. Though not as startlingly original as its predecessor, Soldado still throbs with energy and tension. Featuring a couple of stunning set-pieces – including one major highway shoot-out – it leaves you musing on the blurred line between governments and organised crime, and on just what it takes to maintain order in a morally bankrupt universe.